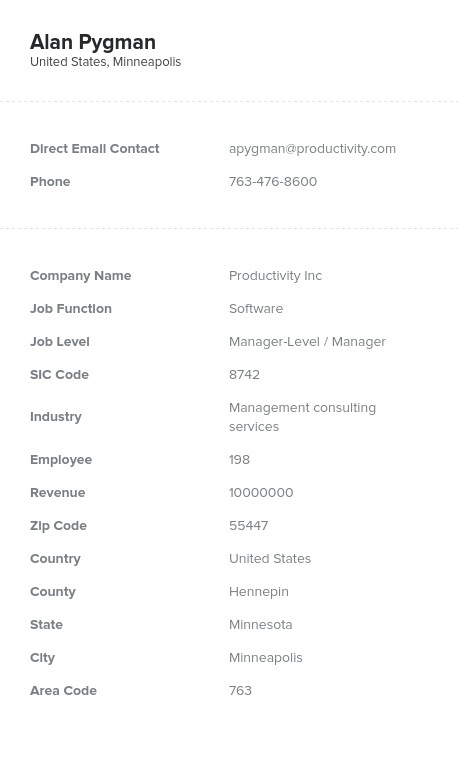 Consult consultants about how your company’s products or services can help them by using this accurate, verified database, which is full of the contact information you need to have that conversation. This consultant email list is pre-built and ready for you to download now. Find, market to, and network with consulting firms easily with the help of Bookyourdata.com's accurate email list. This vast database consolidates the information of consultants and consulting companies and pulls it into one accurate, organized resource, which you can plug into your CRM and integrate into your business-to-business marketing campaign seamlessly. Get in touch with consulting companies, which are often comprised of small, enthusiastic groups and influential entrepreneurs, and start contacting them within minutes of purchasing this resource. There are no hidden fees for using these valuable consulting contacts, so you can get started both quickly and for a fair and transparent price. Download it now to get started, or feel free to use our list-builder tool to further narrow your search. Consulting firms offer expert advice and help to a vast array of clients. They work hard to find the best, most quantified data while making high-level recommendations for a business. Some consulting firms exclusively work with C-level executives, while others work with start-ups. Either way, they need organizational tools, data-pulling software, CRM databases, and an array of knowledge to help their clients. If your company's products or services can help them organize data or communicate with clients more efficiently, then let them know using this list.